A total of 32 Green parties from across the continent have joined forces to found the European Green Party. The first Europe-wide force will run a common campaign and platform for the elections to the EU parliament in June. The creation of a single party at a congress in Rome follows long mediation and efforts to find common ground. The members still want to recognise the national identities of individual Green parties but hope that pooling resources may make the difference in Europe. The new party hymn, created by renowned film composer Ennio Moriconne, was an evocative reminder of the challenges that lie ahead in the Greens' agenda of environmental protection, social justice, governed globalisation and sustainable development. But the atmosphere at Rome's auditorium was much more upbeat as, one by one, the delegates of the 32 founding member countries stepped on stage to adhere to a single European Green Party. Robin Harper of the Scottish Greens said he was proud, excited and happy to be at the birth of the new force. He recalled how his party had grown in a decade from a force with no elected members at any level to having seven MPs in the Scottish parliament. Lack of representation and therefore influence is a major problem for the Greens across Europe. Only in Germany are they in national government. Until now they have worked as a loose federation at the European Parliament but with EU elections looming in June there will now be a common platform, a common campaign and a common voice across the continent. They are hoping that speaking together will make their efforts more effective. However there are deep differences in the history of these parties and in their current policies. The Scandinavians and British are much more Euro-sceptic and there are also differing views on how to deal with EU enlargement. Grazia Francescato, leader of the Italian Green party, said the important thing was to be united on key issues. "You can't imagine how difficult it was, but also challenging and stimulating, to put together 32 parties because of course the concept of environment but democracy also, it's different in Georgia let's say or Finland," she said. "So what we achieve, it's unity and diversity - that's what makes us proud because we have tolerant to each other, we've been trying hard to accept each other's diversity and not impose one pan-European idea on everyone." The Green parties say that as the first pan-European political force they are breaking new ground and want to show their belief in creating a stronger, more independent Europe on the world stage. 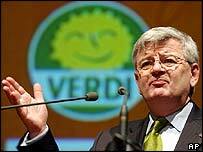 They also hope that the new party will be a turning point in Green influence on European policy.